We recently visited the the inspiring Spertus Building and Center for Jewish Learning and Culture. What we were a little surprised to hear was a rocking Urban Village Church service on the second floor. 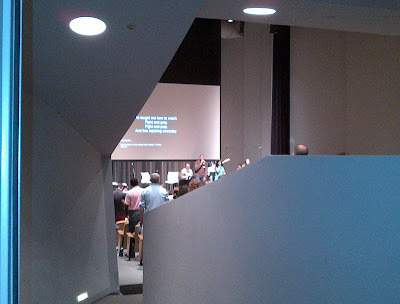 A peak at the Urban Village service in one of the Spertus auditoriums.